The protracted process of choosing a new James Bond is coming to an end, according to Hollywood paper Variety. Screen tests will end this week and four relatively unknown actors are in the running, Variety has reported. The contenders are Layer Cake actor Daniel Craig, 22-year-old Henry Cavill, ER star Goran Visnjic and Australian Sam Worthington, Variety said. 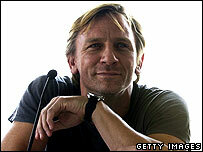 The 21st James Bond film, Casino Royale, will be based on Ian Fleming's first novel and released next year. Producers are thought to be looking for someone younger than the 52-year-old incumbent Pierce Brosnan. Writer Paul Haggis recently told the Hollywood Reporter: "We're trying to reinvent Bond. He's 28 - no Q, no gadgets." In the 1953 Casino Royale book, the spy was introduced as a more youthful, realistic and cold character than he has since become in the films. Daniel Craig, 37, is best-known for playing poet Ted Hughes opposite Gwyneth Paltrow in Sylvia and taking the lead role in gangster film Layer Cake. He is due to appear with Nicole Kidman in alien thriller The Visiting and in Steven Spielberg's drama Munich, about the massacre at the 1972 Olympics. Sam Worthington, 29, got his big break last year when he won an Australian Film Institute award for his role in small-town coming-of-age saga Somersault. Croatian actor Goran Visnjic, 33, plays Dr Luka Kovac in US TV drama ER and has appeared in films such as Elektra and The Deep End. And Henry Cavill, from Jersey, has had roles in movies including The Count of Monte Cristo and I Capture the Castle. Numerous other actors have been linked with Casino Royale including Ewan McGregor, Jude Law, Hugh Jackman, Clive Owen and Dougray Scott. The spokesperson for James Bond production company Eon was unavailable for comment.